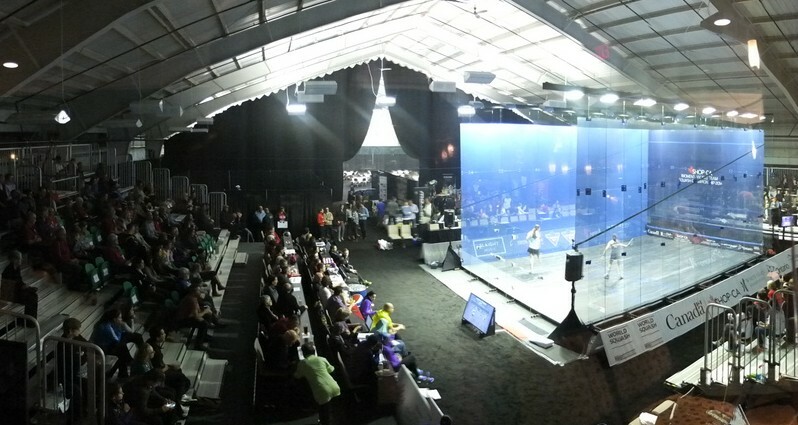 After two dramatic semi-finals in the SHOP.CA WSF Women’s World Team Squash Championship today in Canada, second seeds England will face third seeds Malaysia in Saturday’s final of the biennial World Squash Federation championship at White Oaks Conference Resort & Spa in Niagara-on-the-Lake, Ontario. 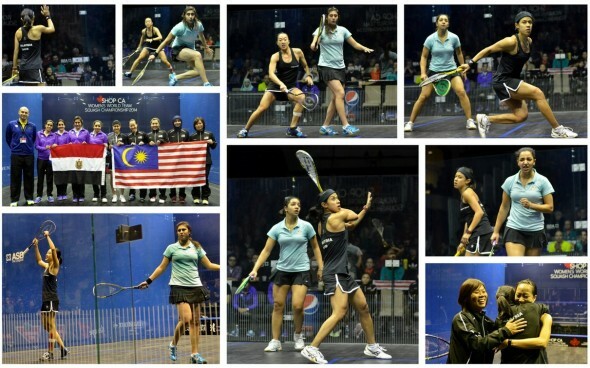 In the biggest upset of the championship, Malaysia – bronze medallists in the past four events – reached the final for the first time after a sensational 2/0 upset over defending champions Egypt, the favourites who boasted a squad of four players in the world’s top ten. In a battle on the all-glass showcourt described by event MC Vanessa Atkinson, the former world champion, as “the match of the tournament”, underdogs Malaysia took the lead when world number one Nicol David beat Egypt’s world No.3Raneem El Welily 11-3, 8-11, 11-7, 11-9 in 54 minutes. David then sat back as team-mate Low Wee Wern, a fellow Penangite who is ranked seven in the world, took on Egypt’sNour El Sherbini, the world No.4 from Alexandria who boasted a 2-1 head-to-head record over the Malaysian. After the first two games were shared, Wee Wern came out fighting in the third to reclaim the lead after dropping just two points. 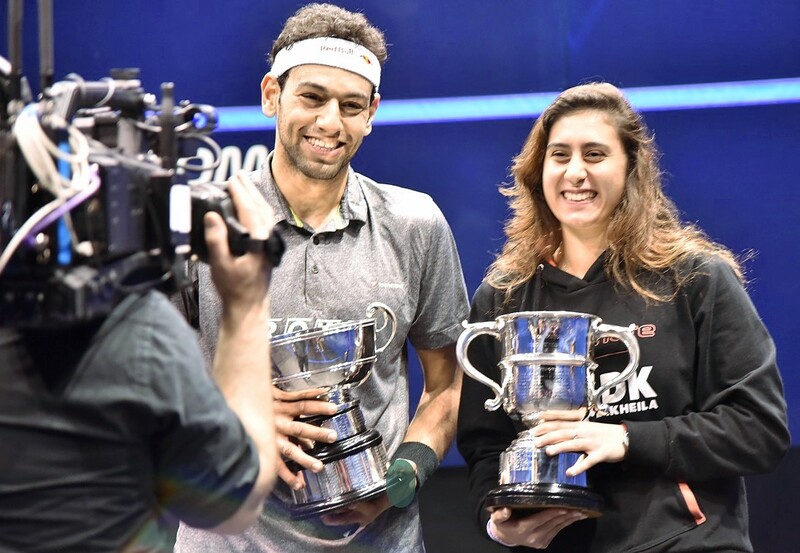 But former world junior champion El Sherbini refused to buckle and took the fourth, and led 3-0, 5-3 and 7-6 in the decider. 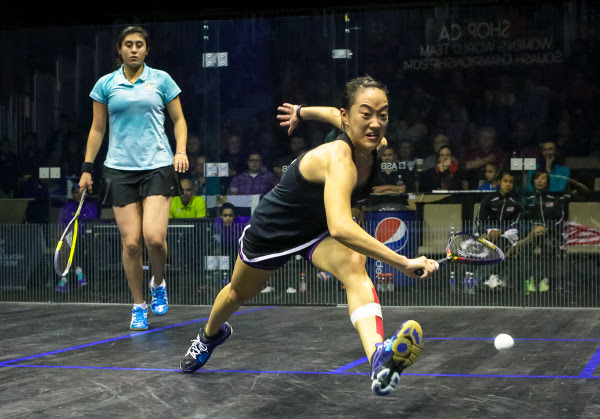 Wee Wern pulled back three points for 9-7 to lead for only the second time in the match – but El Sherbini rallied to bring the score to nine-all. At the first match-ball for Wern (pictured above with El Sherbini), it was a stroke which finally signalled the historic win for Malaysia as Wern raised her arms in victory and quickly became engulfed by her ecstatic team-mates. “I am just so pleased for Nicol. For all these years, she has won for us – and the rest of the team have let her down. Now we have finally done it for her. “Nicol is not just a role model for me, but a good friend too – and this is the first time I’ve given her the support she deserves. “This win is huge – our biggest team success ever – it’s massive. “But it’s not over yet,” added the 24-year-old as her mind turned to the final. England suffered a scare in the first of the semi-finals when Alison Waters, the world No5 from London, went down toJoey Chan in her first defeat in eight meetings to the Hong Kong 23-year-old ranked 18 places lower. 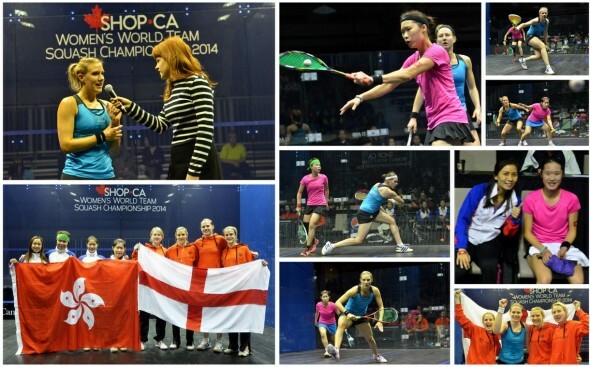 A commanding performance by Laura Massaro saw England take the lead when the world number two beat Annie Au, ranked nine in the world, 11-7, 13-11, 11-4 in 35 minutes – saving four game-balls in the second to go through unscathed. “I didn’t get off to a good start this week – I think I was just lacking match practice – but I worked really hard with the coaches,” said Massaro after her win. “You regroup and do what’s needed to get back into the best possible shape to help the rest of the team. Underdog Chan took the opening game against Waters, but the Londoner fought back to draw level. Left-hander Chan played the game of her life, however, to reclaim the advantage and close out the match 11-4, 8-11, 11-9, 11-3 to force an unexpected decider. “Every time I play Alison, I know it will be a fast game and the rallies will go on and on,” said Chan after her shock win. “I had to keep her behind me. She can so easily dominate the ‘T’, my game plan was to try and move her around. Luckily I didn’t make many mistakes today – I have made too many errors against her in the past. 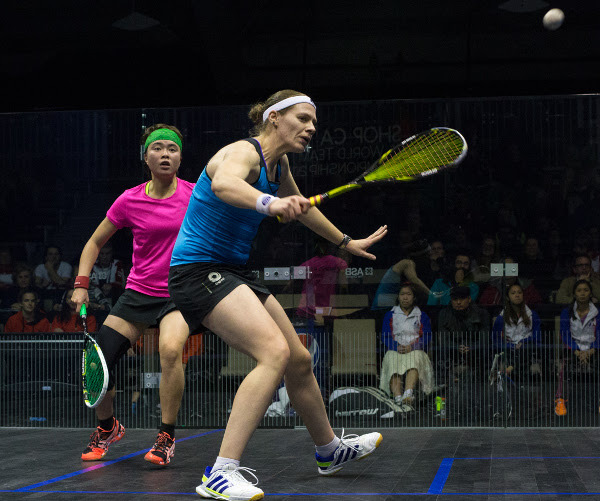 Event newcomer Sarah-Jane Perry, England’s world No.17, took to the court against Hong Kong’s Tong Tsz-Wing, ranked 31 places lower, for the decider. After an incredible first game in which Perry squandered a 10-3 lead to lose 12-10, the 24-year-old from Kenilworth clinched a 10-12, 11-5, 11-3, 11-8 victory. “Firstly, we’ll need to improve tomorrow,” said England coach David Campion as he began his assessment of the tie. “Laura was immaculate – she really showed she’s a world-class athlete and got us off to a great start. “The next match didn’t quite go according to plan,” admitted Campion. “It was not only Sarah-Jane’s first time in the England team in this event, but her first decider – and that was no easy task. She didn’t play her best squash, but under the circumstances it was a good job done. That match will serve her well in her future career. 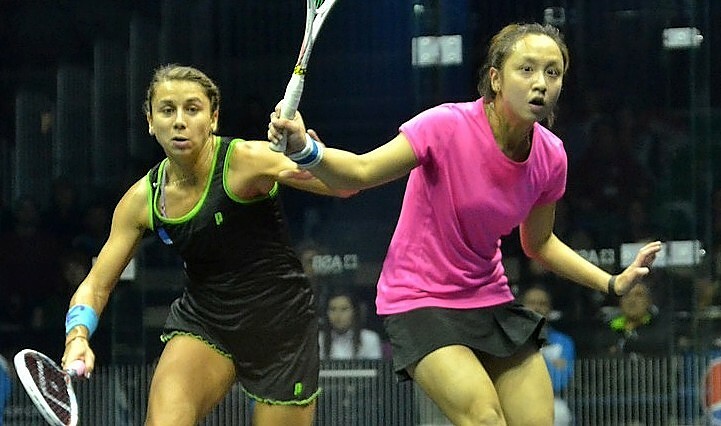 Perry (pictured above with Tong) added: “I played really well to get up to 10-3 – but I let the pace drop and all of a sudden she was in front. The next time I went 10 up or something, I just made sure I finished it off! “I haven’t ever played a decider for England in any event so there was massive pressure. And the fact that it was a semi which we needed to win to get into a record 11th final added to the pressure. But we’ve got a good team behind us. France and USA will battle for fifth place after victories over Australia and Ireland, respectively. Comprehensive wins by top two Amanda Sobhy and Olivia Blatchford ensured at least a best finish for sixth seeds USA since 1983, if not a best outcome of all-time. 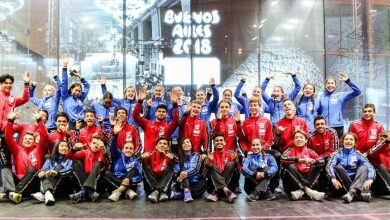 “Our junior programme has been getting stronger and stronger since 2011 when our girls came second in the world juniors,” said 37-year-old team player/coach Natalie Grainger. “This group has been together for a long time now – with Amanda and Olivia leading the way. “My job is to shore things up at the bottom end – I will stay on as long as I can and the job will be complete when other girls take over!